Even for a prosecutor given to colorful metaphors and rhetoric, U.S. Attorney Preet Bharara delivered a particularly damning appraisal of New York’s political culture on Tuesday after unveiling a complaint alleging influence-peddling, secret land deals and bribery in a scheme that stretched from Albany to Queens. Mr. Bharara, the top federal prosecutor in Manhattan, said a series of corruption cases has convinced him that wrongdoing is “downright pervasive” in New York politics. He compared a parade of arrests of elected officials to “a scene from ‘Groundhog Day,’” a movie in which a weatherman is doomed to live the same day over and over again. “Every New Yorker should be disheartened and dismayed by the sad state of affairs in our great state,” Mr. Bharara said. 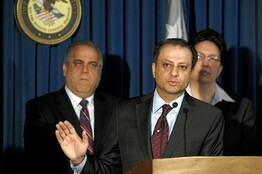 Since his confirmation in 2009, Mr. Bharara has pursued numerous high-profile cases involving elected officials, including the latest probe, which resulted in the arrest of New York state Sen. Malcolm Smith, New York City Council Member Dan Halloran and four other officials in connection with an alleged attempt to interfere with the New York City mayoral race. Attorneys for all six said Tuesday that their clients deny the charges against them. Mr. Bharara’s cases have probed and rattled every corner of New York’s political infrastructure. Most recently, in July, his office won a conviction against former New York City Council Member Larry Seabrook for raiding a publicly funded nonprofit he controlled. In May 2012, former state Sen. Hiram Monserrate, also a former City Council member, pleaded guilty to conspiracy and mail fraud charges, receiving a two-year prison sentence. One month earlier, former state Sen. Carl Kruger was sentenced to seven years in prison after having pleaded guilty in connection with a wide-ranging scheme involving seven others, including former state Assemblyman William Boyland Jr. Mr. Boyland was acquitted in that case but was charged last month with additional counts of federal mail fraud. Prosecutors had previously charged a fundraiser for Mr. Liu, Xing Wu Pan, with illegally funneling donations to the candidate. He has pleaded not guilty, and Mr. Liu hasn’t been accused of wrongdoing. And earlier in 2012, former state Sen. Nicholas Spano pleaded guilty to tax evasion, receiving a one-year prison sentence. Mr. Bharara’s predecessors and others, of course, have had plenty of other ethical misdeeds to occupy their agendas, especially in Albany, where three of the last five state Senate majority leaders, including Mr. Smith, have been indicted, and where a former governor, Eliot Spitzer, was felled by a scandal involving a prostitution ring. The bounty is, Mr. Bharara argued, beyond what his office can or should tackle. “Putting dirty politicians in prison may be necessary, but is not sufficient. And the dream of honest government cannot come to pass unless there is real change in the culture,” the U.S. attorney said. “It’s time for others to step up and do more,” he said. Gov. Andrew Cuomo, who took office in 2011 pledging to clean up state government, on Tuesday defended his own record of public-corruption cases during his tenure as state attorney general. “I spent more time working on political reform and political corruption than probably any attorney general in modern political history. So I take it very seriously and they are serious allegations,” Mr. Cuomo said.